Environment Agency officers are once again out in force to crack down on illegal waste crime around London City Airport. 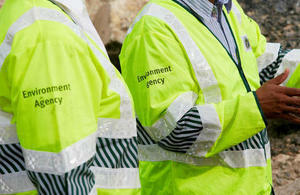 Recently the Environment Agency supported a multi-agency day with partners including the Met police and DVSA - in a bid to reduce and disrupt waste crimes, metal/cable theft, tax evasion and prevent dangerous vehicles from being on the road. During the day of action, vehicles were stopped by officers from the partner agencies to identify offences and non-compliance. On one occasion, a vehicle carrying a suspected stolen cable was stopped. The driver was interviewed under caution by the Police with an Environment Officer on hand to question him about duty of care offences and non- compliance. Environment officers also checked whether waste carriers were providing waste transfer notes to the sites where they collected waste from. We want to make it very clear to people that everyone has a duty of care to ensure their waste is managed and disposed of correctly by the people they give it to. If you use illegal waste carriers to take your rubbish you risk being fined up to £5000. When someone offers to take your waste, you need to check that they are a registered waste carrier with us and they must provide you with a waste transfer note that tells you where they are taking the waste to. Police and DVSA used their powers to prohibit a number of vehicles from being used on the road due to the dangerous defects they identified. DVSA is committed to protecting you from unsafe drivers and vehicles. There’s no excuse for driving with mechanical defects or with an overweight or unstable load. Those on London’s roads who break the rules are putting themselves and others at risk. Working alongside our colleagues in the Environment Agency we’ll crack down on rogue drivers and operators, making London’s roads safer for all. Waste being transported with no authorisations is likely to end-up at unregulated sites. Such sites store waste in vast quantities and for long periods of time posing significant risks to health and the environment. Risks can include fire which has the potential to contaminate water and land as well as air pollution from smoke. Illegal waste sites are often the cause of odour complaints too. People who manage waste illegally cost the taxpayer millions every year in clean-up costs and make considerable sums of undeclared income. They also undercut legitimate business, and pose a direct threat to sustainable growth in the waste management sector. Our enforcement days make sure that the Right Waste goes to the right place ‎to stop unpermitted businesses undermining legitimate businesses and help create a level playing field. Media enquiries: 0800 141 2743.